I was looking for a rat rod to write about this afternoon, and I got distracted from my quest when I ran across this awesome slammed and chopped 1953 Chevrolet pickup truck. 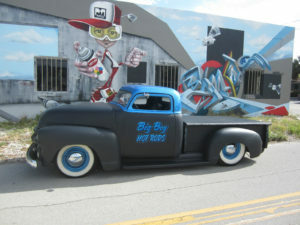 Check Out This Customized 1953 Chevrolet Pickup Truck! In 1953, Dwight Eisenhower became President, Peter Pan flew into literary history, and the slammed and chopped Chevy truck in the picture above rolled off the production line. Okay, some other stuff happened, too, and this truck looked a lot different back then, too. This customized truck has been slammed, which at its very simplest definition, means it sits very low to the ground, with its frame, obviously, I guess, having a very low clearance. A chopped top is also part of the customization this truck has undergone – and at its simplest, the term means a section has been removed from the pillars on the cab, and the windshield has been sectioned to accommodate the shorter space. The stunning mate black and vibrant blue theme is carried through to the interior of this ’53 Chevy truck, with black seats featuring blue welt for contrast, a blue steering wheel, and incredible lacy blue floral graphics painted over a black base on the dashboard. This truck is a piece of art just as much as it is a vehicle, and it’s listed for sale or trade on eBay and there will be a couple more photos dropped on the Classifieds page here on the site if you want to check them out. Classic Cars Online US is proud to partner with Izea and eBay to bring you this information on the 1953 Chevy Truck by showing you the ’53 Chevrolet Pickup: Classic Truck for sale in the photo.